Thousands of people have rallied in Paris against abortion and medically assisted reproduction as part of the annual March for Life. Participants on Sunday marched through the streets of the French capital chanting: "Everyone for life, life for everyone". The Paris March for Life, now in its 13th edition, is held every year in late January, to coincide with the anniversary of the 1975 law that legalised abortion in France. The demonstrators, who claim to have the backing of Pope Francis and several French bishops, called on doctors across the country to use their "conscientious objection" and stop performing abortions. 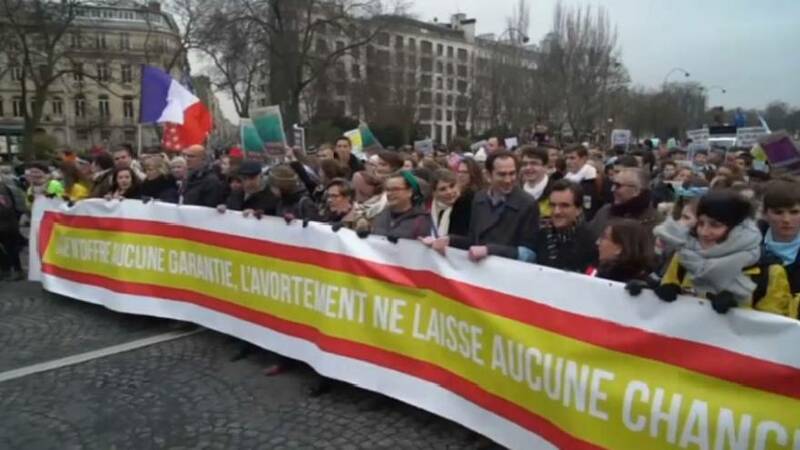 They also protested against a recommendation in September by France’s top bioethics body that single women and lesbian couples should have access to medically assisted reproduction. An estimated 200,000 abortions are performed every year in France, where terminations are legal on demand up to 12 weeks after conception. A group of pro-abortion protesters also gathered in a counter-demonstration on Sunday. Women’s rights activist Jessica Vandermark told AP she was surprised by the number of people joining the March for Life. “I find it very unsettling,” she said.